"My Horse Warrior" was published in 1934. The author Lord Mottistone was better known as General Sir Jack Seeley and commanded the Canadian Cavalry Brigade on the Western Front during the Great War. Warrior was his mount during this time. General Jack, as he was better known in the Army, came from the Isle of Wight and Warrior was born and grew up on his farm there. That aside Warrior was obviously a very good tempered, intelligent, brave, willing, popular and affectionate horse. Anyone reading the book who likes horses will warm to him. General Jack saw war in the raw between 1914 and 1918 and like most traditional soldiers he does not shrink from this nor does he dwell on it or dramatise it. His accounts are factual and understated of events that must have been searing at the time. At one point Warrior's stable is demolished by a shell and the poor horse is buried alive. You can feel the General's fear and worry as he describes the soldiers digging him out and I felt a bit sick myself as it is very easy to imagine from his description a favourite horse of your own in such a predicament. In 1918 the General, riding Warrior, led the brigade in a desparate mounted attack on the advancing Germans fighting hand to hand with swords. This must have been horrific, but is sensibly left largely to the imagination. 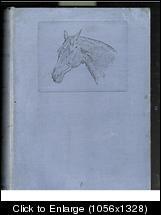 The book is illustrated in black and white drawings by Sir Alfred Munnings, one of Britain's foremost painters. Lord Mottistone writes well and the book has warmth and charm. I could not put it down. I think it would make a good film. Now to the sad part. I bought mine for £4 in the Charing Cross Road last year. Now unfortunately they are going for stupid prices - none under £95, so very few people will be able to read this super book. It would be nice if a new cheap edition could come out perhaps to help a horse charity like the Brook Hospital. The soul of a horse is a great and loyal soul... Above all it is a courageous soul, and an affectionate soul. But let there be one cruel blow from a grown up man and you have ruined the horse's fine soul and spirit for ever. It is my dream that those who read this book may vow never to beat a willing horse"
5 Horse Shoes - surely worth a reprint? Now to the sad part. I bought mine for £4 in the Charing Cross Road last year. Now unfortunately they are going for stupid prices - none under £95, so very few people will be able to read this super book. I was extremely lucky to find a copy at a car booty last year for £1. Good review tintin! I enjoyed this book very much too and agree it's worth a reprint. Thanks for that review. I havent read it but would like to after reading this - but not if I have to pay £95! Interesting that both of you picked up a cheap copy, just shows there are still some bargains around. You must have better car boot sales than ours Rosie, very rarely see a book nowadays, let alone an old one. You could try contacting Fidra Books tintin and making a case for it, as they do re-publish a few old horse stories but as they tend to go for the more commercial titles, I wouldn't hold out much hope. Incidentally we did have a thread a little while ago about books we would like reprinting. I'll see if I can find it and provide a link. You can add your suggestion there. Talking of re-prints I've just stumbled across this! Well spotted rosie. Nice to see they are doing a repint tho its not that cheap. Great review of the book. I've only just started reading it (well, the reprint "Warrior - The Amazing Story of a Real War Horse") in the run-up to the Steven Spielberg version of "War Horse" being released next month.